The cornerstone of the new college was blessed on July 11, 1831 by Archbishop Whitfield. By 1833, two-thirds of the construction was complete, but due to the death of Carroll and the lack of funds, construction was halted. It was not until sixteen years later that the building was finally complete. In 1848, St. Charles College opened with four students and two faculty members. 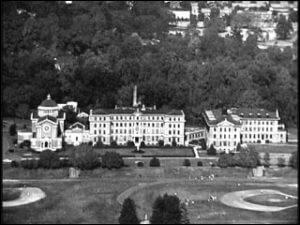 By 1865, the college had 45 students from the Archdiocese of Baltimore in addition to students from other dioceses. By 1876, the number of students grew so large that Archbishop Bayley encouraged the Sulpician community to expand St. Charles College. 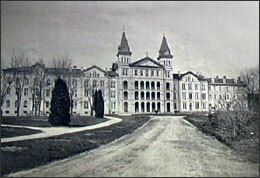 St. Charles College was destroyed by fire in 1911. It was decided that the new campus would be rebuilt near Catonsville, on land previously acquired for a house of philosophy. In a continued effort for expansion, Archbishop Curley donated most of the $200,000 he received on the occasion of his silver jubilee of ordination so that an administration building could be finished. Then in 1960 ground was broken for an $800,000 dormitory and classroom building. The high school at St. Charles College was discontinued in 1969, and the seminarians studing philosophy on Paca Street (part of St. Mary’s Seminary) were moved to St. Charles College. Those students were to become the junior and senior classes of St. Mary’s Liberal Arts College. That college was subsequently closed as well. Source: Spalding, Thomas W., The Premier See: A History of the Archdiocese of Baltimore, 1789-1994.